You can make this party punch up to 24 hours ahead of time. Chilled sangria on a hot summer day reminds me of Spain. Sitting on a street-side patio with plates of pintxos in Bilabo or Amorebieta. Sipping a glass of sangria brings back some of my sweetest summer memories, so of course it’s the first thing I want to share with friends when thinking up party menus. While hunting down ideas for an inexpensive party punch, I figured boozy lemonade would be a simple, refreshing way to keep the crowd happy. But instead of spiking it with vodka or bourbon, Spain memories came calling, so I hit the kitchen and mixed a little white wine with a half-glass of lemonade. The result was exactly what I had hoped for. A drink unexpectedly light and bright. 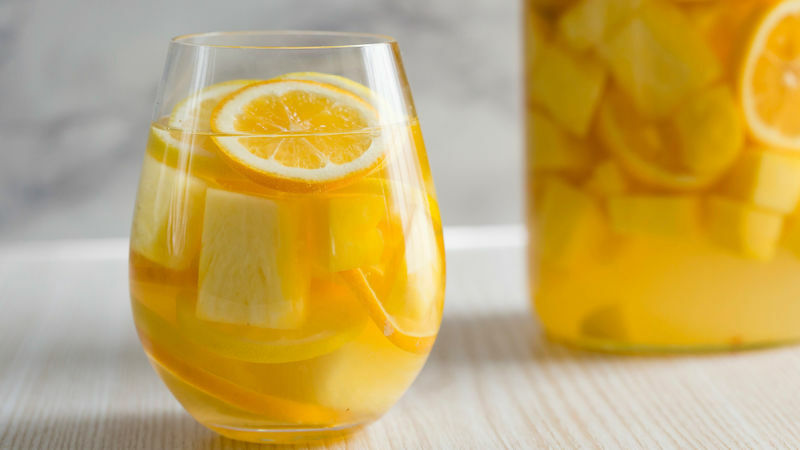 We pulled out a pitcher, tossed in lots of yellow-colored fruits—lemons, mangos and pineapple—for an extra-sunny touch, then let it all soak for a few hours until the drink was ice cold and ready for pouring. Perfect for punch bowls or gallon-sized pitchers, this summery drink pairs beautifully with grilled eats and favorite friends. Enjoy.